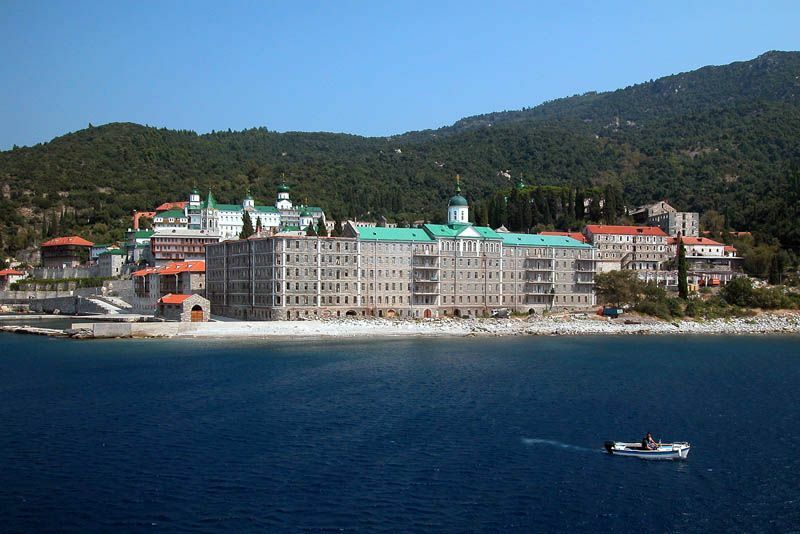 Fire broke out at 15:30 on Saturday in the Monastery of Agios Panteleimonos, also known as the ‘Russian Monastery’, in the semi-autonomous monastic community on the Mount Athos peninsula. 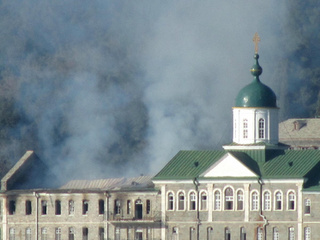 Authorities said that neither human lives nor the monastery church were at risk. 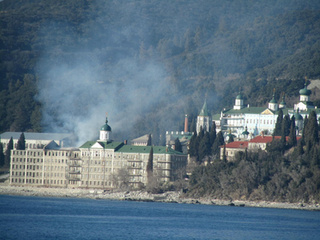 According to information given to the ANA-MPA by the Mount Athos fire brigade, the fire began in the wing containing the monks’ cells and there are currently six fire engines and 12 firemen fighting the blaze (text from Athens now Blog). It is said the fire is under control now (photos thanks to Athos Blog Kelliotes). It looks like a part of the building (the guesthouse) and its roof, left from the green church, is burned. Panteleimon with the roof still intact. This entry was posted in 19 Panteleimonos, events and tagged fire. Bookmark the permalink. Congratulations on your Holy Mountain blog! It seems to be very thorough. Now you have a follower in Chile. Was especially interested in Constamonitou. It was snowbound and spartan when I stayed there in 1978 but very quiet. I hope the place continues to keep itself to itself, unlike the “big time boys” in houses like Vatopedi. Nicholas from Chile, thanks. We were at Konstamonitou in 2009. I shall post the pictures soon. With the last picture it is clear that it was not a small fire. The whole roof is gone!